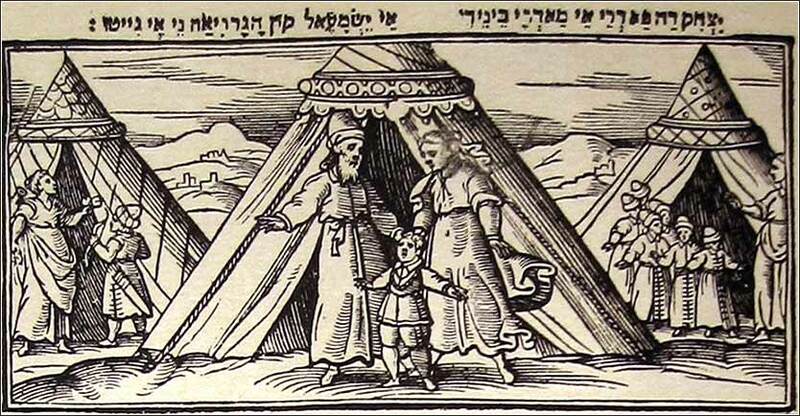 The wives and sons of Abraham depicted on the 1630 Venice Haggadah. Keturah stands at far right with her six sons. 262 people in our community are currently praying with you. Heavenly Father, I do not fear this day, for you are with me wherever I might go, your light to shine ahead, your footsteps to lead the way. I do not fear this day, for your word will be my guide. Your strength will sustain me and your love revive me, this day and all days. I do not fear this day, for you are with me. In the name of Christ, I call upon you. Oh Lord, I remember before thee today all the workers of the world; Workers with hand or brain: Workers in the cities or in the fields: Those who go forth to toil and those who work at home: Employers and employees: Those who command and those who obey: Those whose work is dangerous: Those whose work is monotonous or mean: Those who can find no work to do: Those whose work is the service of the poor or the healing of the sick or the proclamation of the gospel of Christ At home or in foreign places. May the word I have read, Lord, be planted deeply in my mind and heart. Help me not to walk away and forget it, but to meditate on it and obey it and so built my life on the rock of your truth. Mason Barge 1/14/2017 origin unk. 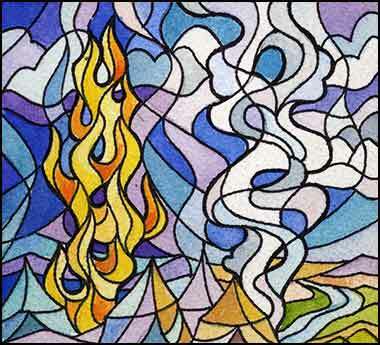 Pillar of Fire and Cloud, design for stained glass by David Ascalon. And by Your wrath we are terrified. Abraham took another wife, whose name was Keturah. She bore him Zimran, Jokshan, Medan, Midian, Ishbak, and Shuah. Jokshan fathered Sheba and Dedan. The sons of Dedan were Asshurim, Letushim, and Leummim. The sons of Midian were Ephah, Epher, Hanoch, Abida, and Eldaah. All these were the children of Keturah. Abraham gave all he had to Isaac. But to the sons of his concubines Abraham gave gifts, and while he was still living he sent them away from his son Isaac, eastward to the east country. This passage is not very interesting reading, especially after the colorful history of Abraham's life. First, it is full of weird names. But consider, for a second, why all of these names seem so odd, and yet, the names of Abraham, Sarah, Isaac and Rebecca seem so normal. It is because we are the descendants of Abraham, in faith if not seed, and our forebears have been using their names for their children for 3500 years. If, say, the sons of Abraham had been named in opposite order, we would have studied the physics of “Sir Ishmael Newton” in school, and “Isaac” would seem weird and foreign to us. “President Asshurim Lincoln” might have freed the American slaves. We are tied, by the names we have given our children, to a continuous civilization that is 3500 years old! We bear the names of people blessed by God. Abraham's relationship with Keturah, and his many offspring, is the source of great mystery and much speculation and debate among Christian, Jewish, and Muslim scholars. She is referred to here as his wife, and that gives us no problem, because our current culture treats a second monogamous marriage, after the death of a spouse, just like a first marriage. By this accident, we do not blink at the news. But things are not so clear. The culture of Canaan at the time was bigamous and men were allowed to have two wives, or a wife and a concubine. We might find it implied that Sarah had died when Abraham wed Keturah, but the passage doesn't say this; we simply assume it. Moreover, Keturah is called Abraham's “concubine” elsewhere. And, remember, Abraham was very old when Sarah died, but bore six sons (and likely some unnamed daughters) with Keturah. Equally mysterious is what became of the sons. It is unthinkable that they were not circumcised; Abraham circumcised even his adult male servants. But yet, they were not men who transmitted the old covenant, for God is to renew His covenant with Isaac. It is easiest to think that Isaac was Abraham's heir, both of his fortune and of his covenant with God, for it is through Isaac that the Jews (including Christ) trace their genealogy. And it is possible that the offspring of all Isaac's many half-brothers, who were given gifts and sent to live in the east, were eventually assimilated among the many tribes of the vast world to the east of the Jordan River. Or, perhaps, they returned to live with Joseph into Egypt, and their heirs appear in Exodus. Nobody knows. 1 Corinthians 1:13 (NKJV): Is Christ divided? Was Paul crucified for you? Or were you baptized in the name of Paul?